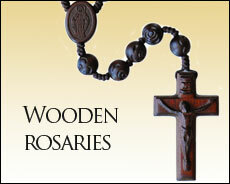 Shop our large selection of wood rosaries. Variety of styles, sizes and prices. Choose from corded rosaries, St. Benedict rosaries, jujube rosaries, and many more. Shopping with us is easy, we offer secure shopping, free shipping, and free returns.